We make it simple and easy with our estate jewelry loans from your pawn shop in Casa Grande. Estate jewelry is simply another for “used, vintage or antique jewelry.” In fact, ESTATE JEWELRY gets it's name since it is usually found at estate sales as antique jewelry, vintage jewelry, and period jewelry. Since it has generally been passed down from a relative it is very common for estate jewelry to not have a receipt or any documentation verifying where it came from. That is why it is very important to bring your pieces to Casino Pawn and Gold located in Casa Grande , so our well trained staff can correctly appraise and authenticate your jewelry, gold, and diamonds for an estate jewelry loan. Estate jewelry can date back as far as the early Victorian era (1837-1855) and can be more recent, such as the Retro jewelry era (1945-1960). Although people do sometimes confuse estate jewelry with antique jewelry the truth is that estate jewelry is simply nothing more than a pre-owned piece. 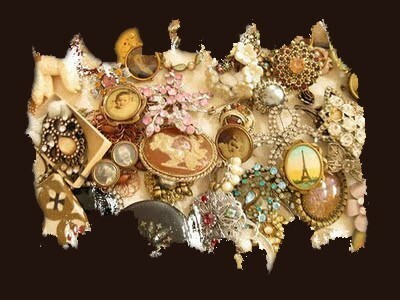 Whereas antique jewelry must be at least 100 years old to be classified as antique jewelry. Although antique jewelry may be estate jewelry, estate jewelry is not always necessarily antique jewelry. Stop into today and we will view your piece for most cash paid with our estate jewelry loans inside our highly rated store in Casa Grande, serving the surrounding areas of Coolidge, Maricopa, Eloy, Arizona City, and the Florence Area. The most important part of any loan process is determining how much cash you're able to actually get. With estate jewelry loans, the value is based solely on the value of your collateral which in this case is going to be jewelry. What's ideal about Casino Pawn and Gold is that if you have diamond jewelry that also contains gold and silver, we value the two separately to ensure that you're being paid for every last inch of your jewelry. Having offered estate jewelry loans for the better part of a decade in Arizona City, Eloy, and Casa Grande, you can rest assured that we loan the most amount of cash possible. The valuation process all begins when you bring your estate jewelry down to our pawn shop. One of our associates will take the jewelry from you and begin to look for what is known as a stamp. This is a mark left on gold and silver jewelry that indicates purity. This is typically hidden in a tough to find location such as the inside of a ring, or the clasp of an earring or necklace. While these stamps are not always perfect indicators of purity, they give us a starting point for testing your jewelry. The definitive test we perform is an acid test to ensure that the purity matches. This does not damage the jewelry whatsoever. The last thing we do is get its weight in grams. This combined with the purity of the estate jewelry gives us your cash loan price and, should you accept, we'll collect a few signatures and send you on your way with cash in hand. Throughout the duration of the loan, your jewelry sits on our secured, monitored safe so you can rest assured it will be there when you're ready to come get it. Why take out a loan on your Estate Jewelry? With over 30 years of extensive knowledge within the jewelry and diamond industry, Casino Pawn And Gold in Casa Grande, has the experience to know what your estate jewelry, vintage or antique jewelry is worth and will loan you the most with an estate jewelry loan. We offer free appraisals on your estate jewelry and we have the ability to give you a loan on your jewelry so that you can get them back. This way, you won’t lose your sentimental items forever. What Estate Jewelry do we loan on? We loan on all type of estate jewelry including: diamonds, watches, bracelets, rings, necklaces, earrings, pendants, designer jewelry, gold, silver, and platinum. We’re able to make a loan on individual items as well as an entire lot and always loan out top dollar on your estate jewelry with our estate jewelry loans in Casa Grande. We are actively seeking jewelry by, Rolex, Tiffany, Breitling, Cartier, Audemars-Piguet, Breguet, IWC, Patek Philippe, and ALL other major brands. Don't forget we serve the surrounding areas of Coolidge, Maricopa, Eloy, Arizona City, and the Florence Area.